Figure A73. Rockall anomaly, interpreted as the Rockall slab, with (horizontal) [vertical] cross sections through (A)[D] the UUP07 p-wave) and (B)[D] the combined SL2013 and S40RTS s-wave models at 2550 km; C) the location of the modern geological record that we interpret to have formed during the subduction of the slab. 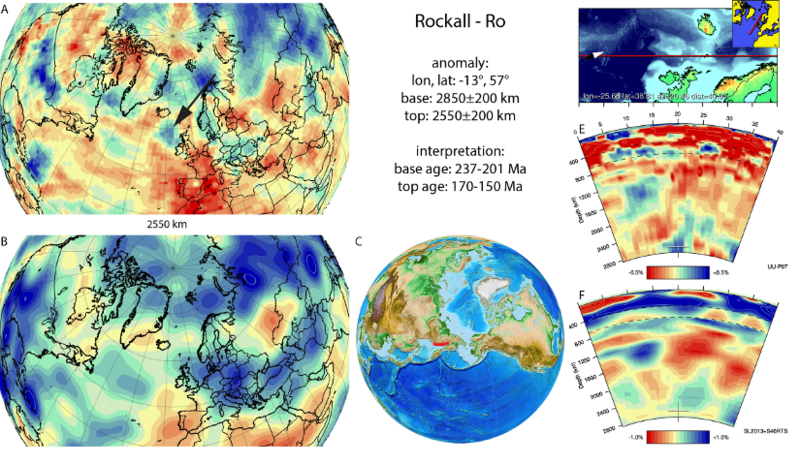 The Rockall anomaly (Figure A73) is located west of the British Isles under the eastern North Atlantic Ocean and lies on the core-mantle boundary. It was first identified in (van der Meer et al., 2010). The Mongol-Kazakh slab to the east, the Wichita slab to the west and the Balkan slab to the southeast were used by (van der Meer et al., 2010) to interpret the anomaly as the Rockall slab that resulted from Early Mesozoic subduction between Siberia and Laurussia in the paleo-Arctic Ocean. The paleogeographic location is similar to the Upper Triassic-Lower Cretaceous continental margin Kony Murgal arc (Nokleberg et al., 2000). Shephard et al. (2013) renamed this to the Koni-Taigonous arc and narrowed its age range down to (Late) Triassic-Late Jurassic (160 Ma), which we adopt as age range for the Rockall slab.